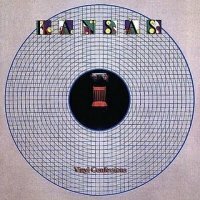 Having become increasingly rare on CD of late, 'Vinyl Confessions' is a largely ignored part of the history of the great US progressive band Kansas, but also one that benefits from a re-appraisal. By the beginning of the 80s a great deal of jealousy had built up in singer Steve Walsh about bandmate Kerry Livgren, who he thought was getting all the attention from the record company and having all his songs released as singles. It was also a bone of contention that Livgren had become a devout born-again Christian, which was at odds with Walsh's rock star lifestyle, so by 1982 Walsh had left to form his own band Streets with Billy Greer, Tim Gehrt and Mike Slamer, while Livgren and the remaining Kansas members replaced the iconic vocalist with unknown Christian singer John Elefante. What was perhaps odd about this arrangement was that Livgren continued to mostly write on his own, whilst Elefante and his brother Dino contributed four of the album's strongest songs, with the album being co-produced by the band with Englishman Ken Scott - famous for his work with David Bowie and Supertramp. At this point Kansas - completed by Robbie Steinhardt (violin, vocals), Phil Ehart (drums), Dave Hope (bass) and Richard Williams (guitar) - were still selling quite well and the storming AOR anthem 'Play The Game Tonight', which opens this album, was a big US hit, and there were many other strong moments on 'Vinyl Confessions' too. Of the Elefante brothers' songs, the beautiful ballad 'Chasing Shadows' was probably the strongest, but 'Right Away', 'Face It' and especially 'Play On' were all written in a typical Kansas style, with Elefante's strong voice being really enjoyable despite lacking the real fire of Walsh's rougher delivery. Livgren weighed in with some great tracks too, particularly the busy 'Windows' and the brilliant, multi-textured 'Cross Fire', but he was also responsible for some treading water moments with the heavily orchestrated 'Diamonds And Pearls' and the dull 'Fair Exchange' lacking good choruses. It was also ominous that Robbie Steinhardt's violin and vocals played an even smaller part than before, although I'm sure he must have been aggrieved that Walsh had left and he still wasn't the main singer. The reviews for the album at the time were mixed, and it seemed that the people who thought the band had gone too commercial with 'Audio Visions' liked this one even less. However, if you dig deep enough the sublime Livgren arrangements are still there on most of the songs, which is made more apparent by Rock Candy's great remastering, giving the album much more sparkle than the LP or the flat sounding original CD release. Given Kerry Livgren's recent stroke it's perhaps unsurprising that he didn't contribute to Howard Johnson's excellent sleeve notes, but John Elefante tells the tale of the album from his perspective and it's a good read. 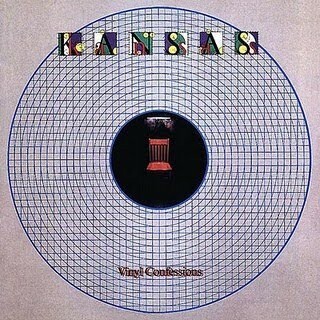 'Vinyl Confessions' isn't one of the Kansas classics but there's too much class here for it to be the cuckoo in the nest.